Happy Tuesday! It's time for another challenge at The Stamping Boutique! This week's challenge is all about Thanksgiving. I am always so thankful for all that I've been blessed with. Our lives are so busy that at this time of year, I'd like to slow down and really think about all the blessings that I have in my life. 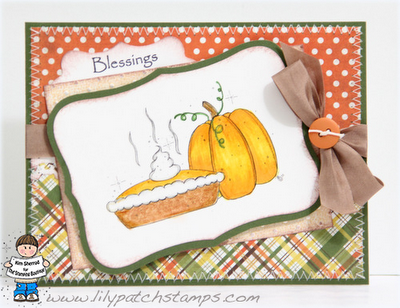 On my card I used the pumpkin pie image and plaid and polka dot papers. Oh I love the plaid and polka dot combo. It's so fun to use. I also added some stitching and a button and bow. Make sure you head on over to The Stamping Boutique's challenge blog and enter to win some fun stamps and check out the awesome DT inspirations. The Stamping Boutique is also having a huge 35% off sale. Oh My goodness, this is so wonderful. I love your colors and design. To Be Eligible for prizes,you must be a folower. If you are a follower wonderful. If you have forgotten just come to the main page and click to follow. A beautiful card! I love your colour combo and I agree that your pattern combo is gorgeous! KimThis is so beautifully designed. Love the colours. Thanks for sharing your talent with us. Good luck. Oh, this looks yummy!! Love the bow. Thanks for joining us at Digi Darla's this week and hope to see you again! Great coloring and I can almost smell the aroma of that pie!!! Thanks for sharing with us at Love to Create Challenge. What a lovely card. Thanks for joining us at Kaboodle Doodles this week. Gorgeous, Kim! Love your coloring. Now, let me put on another of my DT hats and thank you for playing along at Tammy's Scrapin Corner this week. Happy Thanksgiving! Oh this is darling!! Love all of your stitching all around. Brings it all together so nicely!! Thanks for playing this week at Digi Darla's!! Nice image, well colored and beautiful papers! What a yummy card. Thanks for joining us at Sweet Stamps. Great card. Thanks for joining us at Kaboodle Doodles. Very pretty. I just love the colours and the sketch you have used. Image is perfect. Thanks for joining us at Tammyscrapincorner this week. That Pumpkin on your card looks good enough to eat, love pumpkin pie! Thanks for joining us at Digi Darla's! What a fabulous card, love the pumpkin! Thanks for playing with us at Digi Darla's! Thanks for joining us this week at Digi Darla's Challenge. Good luck and hope to see you again next week. Sweet fall card! Love the bow with the button especially! Very yummy makes me hungry looking at it. What a lovely Thanksgiving card! Thanks so much for sharing with us at Creative Card Crew!